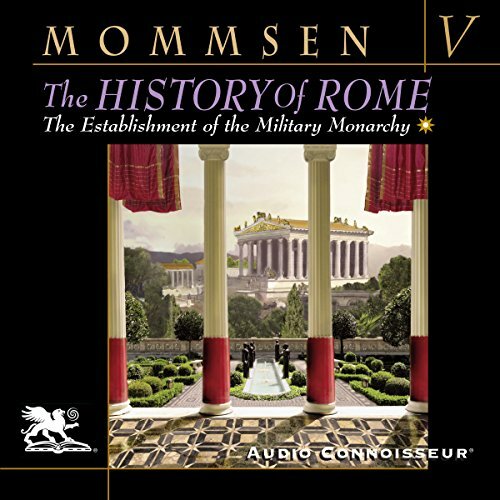 The History of Rome, Book 5: The Establlshment of the Military Monarchy by Audio Connoisseur at Spring Brook Audio. Hurry! Limited time offer. Offer valid only while supplies last. Nobel Prize/Literature/1902 Book 5 of Mommsen's history of the Roman Republic brings to a conclusion this most magnificent of historical narratives. Book 5 of Mommsen's history of the Roman Republic brings to a conclusion this most magnificent of historical narratives. It begins with the death of Sulla and ends with the accession to power of the greatest and most fascinating Roman of them all, Gaius Julius Caesar. With the aristocrat Sulla's premature and unexpected death, the Populares (democrats) plotted their comeback. But the senatorial democrats lacked charismatic leadership and no longer had a Marius or Gracchus to call upon. The democrats needed a senator with renowned military experience and glory, something which the senatorial aristocracy (the Optimates) also lacked. Both factions turned to the young, promising general, Pompey, fresh from his successful campaign in Spain. Initially, Pompey chose the democrats. But political instability soon returned. Social unrest had become the disagreeable norm. And with the rise of the incomparable Julius Caesar, the people finally found the leader they were waiting for. Followed by Caesar's conquest of Gaul, the display of his ingenious executive skills, and his advocacy of public-minded reform, Caesar emerged as the necessary and welcomed leader in the movement toward resolution of the sorry and bloody debacle of debt, aristocratic privilege, and civil strife. Eventually, civil war became inevitable when Pompey accepted the leadership of the Optimates, the oligarchic faction which was in deadly opposition to the common people. By accepting this leadership, Pompey vaulted to the head of a party dedicated to the material interests of Rome's wealthy bankers, merchants, and landed gentry who looked favorably on a dictatorship which protected their interests. But Caesar was too quick for Pompey, and prevailed in the subsequent bloody civil war. His victory ushered in an incredible series of reforms which were to shape Roman affairs for another 500 years. Caesar's dictatorship became the model of a military monarchy which guided the Roman Empire until its demise. Although Mommsen used the A.U.C. system of Roman years, which begins as the Roman year one (754 BC), we have transposed these dates to those of the Christian era. All dates are BC except where otherwise indicated. We do not recommend Mommsen for those without a proper understanding of Roman Republican history. The work of Cyril Robinson would be a great place to start for the amateur, armchair historian. Translated from the original German by W. P. Dickson. View More In Ancient Civilizations. If you have any questions about this product by Audio Connoisseur, contact us by completing and submitting the form below. If you are looking for a specif part number, please include it with your message.